Bawbag the second, a photo by PhylB on Flickr. About 30 years ago either the council or Scottish Power erected about thirty fast-growing conifer-type trees around the small electricity sub-station in front of my parents' south-facing garden. No one asked the residents around the triangle of grass if they wanted them, they were simply put there. No one was particularly upset about them at first but ten years on they had become thick and tall. Groups of kids would sit in the trees at night talking, keeping the residents of the three adjacent streets awake. Also the trees obscured all the sunlight from my parents' garden from 1pm to 7pm on a summer afternoon. They were a nuisance. They phoned the council and asked them to remove them. They were told their maintenance was the residents' responsibility. 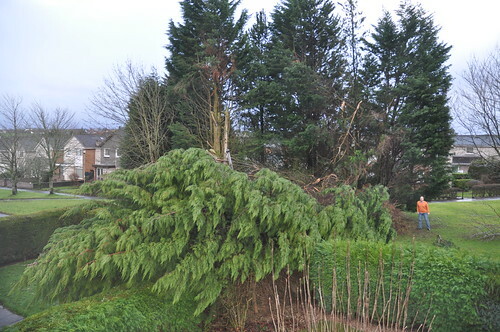 A quote of over £3K was obtained to chop the tops off the trees and thin them down. The ten houses overlooking the trees felt somewhat aggrieved that they should pay. Dad and his neighbour, Steve, tried Scottish Power and his local MP to no avail. A fifteen year battle ensued but no one would budge. Every summer dad, Steve and a few others went out with ladders and saws and chopped chunks of the trees but they were unmanageable. Their house was dark all day in winter and cold and shadowy all day in summer. They moved into my garden for sunbathing. Dad never once said anything positive about the trees... well not until Bawbag last month. You know pet, he said, I think that tree might have protected us from the full assault of Bawbag! 6am today, and despite not receiving anything like last month's red alert warning, something much worse than Bawbag woke Newton Mearns up. I was shaken from my sleep by crashing and smashing at my house. At the other end of Crookfur, Dad was snoozing soundly and somehow managed to sleep through the event... so he got a seriously big shock when he drew his curtains to find the tallest and most annoying of the trees lying between his and Steve's garden. Steve was already in his garden dancing and taking photos! On inspection, the lamp post outside his house was snapped in two and cables and wires from the substation were swaying in the wind. When I visited ten hours after the crash, the wires were still blowing in the wind! The roots were an impressive height off the ground. And I'm not quite sure how one is meant to use the footpath for now! Let's hope the tree wasn't my parents' only wind shield, given the winter we seem to be having.